Many seniors experience fading eyesight, but this doesn’t mean vision loss is inevitable. 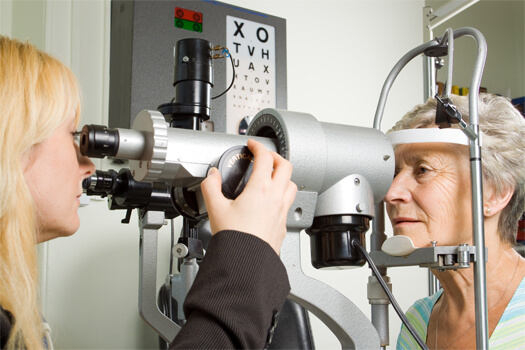 There are several ways older adults can maintain their eyesight. The following tips can help seniors keep their vision as strong as possible while they age. A lot of age-related vision loss is due to macular degeneration, cataracts, glaucoma, and other eye diseases. Many eye-related disorders gradually cause damage that may be irreversible, so it’s important for seniors to see an eye doctor as soon as possible. Regular doctor visits ensure eye disorders are promptly diagnosed and treated before they worsen. Older adults who need help attending their medical appointments can benefit from professional in-home care. When searching for reliable Toronto home care agencies, families want to know their senior loved one will be well taken care of. At Home Care Assistance, our expertly trained caregivers are available around the clock to assist with tasks around the house, provide transportation to medical appointments and social events, and much more. Some research suggests that certain types of senior vision loss may happen because the brain gradually stops processing low-contrast images correctly. Practicing visual training exercises, such as focusing on objects near and far away, may help the brain stay healthy and properly read input from the eyes. Macular degeneration and some other forms of vision loss may be linked to certain nutritional deficiencies. Making sure your loved one consumes a lot of vitamins A, C, and E to protect the eyes and keep them working properly. These vitamins can be found in many forms of fresh produce, including leafy green vegetables, tomatoes, carrots, peas, corn, kiwi, mangoes, and oranges. Some senior citizens need help shopping for nutritious foods and preparing healthy meals at home. If your aging loved one needs occasional help with bathing, grooming, cooking, or other basic household tasks, or if you need time to attend to important personal matters, reach out to Home Care Assistance, a leading provider of live-in and respite care. Toronto seniors can maintain their independence while living at home with the help of our reliable respite caregivers. Many seniors lose their eyesight due to complications with diabetes. If diabetes is left untreated, excessively high blood sugar levels can damage the nerves of the eye and eventually result in blindness. To prevent blindness, seniors should exercise regularly, take any medications needed to manage their diabetes, and avoid eating processed foods. A lot of favorite pastimes are very exhausting for the eyes. Long hours spent staring at a computer screen can wear out the delicate muscles that control the eyes. Seniors can avoid eye strain by just closing their eyes for a few minutes every hour, especially if they spend a lot of time reading or using the computer. Vision loss is far more likely among seniors who smoke tobacco. Smoking harms vision because it impairs the circulatory system. Without the ability to get fresh nutrients and oxygen quickly, the cells of the eyes may begin to degrade. Though quitting smoking can be challenging, it is worthwhile for seniors who care about their vision. Older adults can boost their overall health by making a number of healthy lifestyle choices. If your aging loved one needs help managing everyday tasks or encouragement to adopt healthier lifestyle choices, turn to Home Care Assistance, a leading provider of senior care. Toronto Home Care Assistance provides professional in-home caregivers around the clock to help seniors live longer, happier, and healthier lives. Whether you need a break from your caregiving duties or your loved one needs extensive 24-hour care, give us a call at (416) 488-8777 today.